Travelling full-time with Type 1 Diabetes is challenging. As I wrote in Dealing with Medical Supplies While Travelling, an irregular routine makes controlling my blood sugar harder, plus I must carry an extra bag full of supplies. However, my least favorite challenge is going through airport security. My medical equipment cannot safely be x-rayed. Therefore, I cannot take it off and place it in my baggage, and I cannot go through a body scanner. When I have TSA pre-check status, I can go through the metal detector, but that doesn’t buy me anything. I always tell TSA about my equipment. However, they ALWAYS (12 out of 12 flights so far) still demand that I receive a full pat-down. Similar policies are in place in Europe. I think it’s rather humorous to read the instruction booklet for my Dexcom G6 CGM medical device. 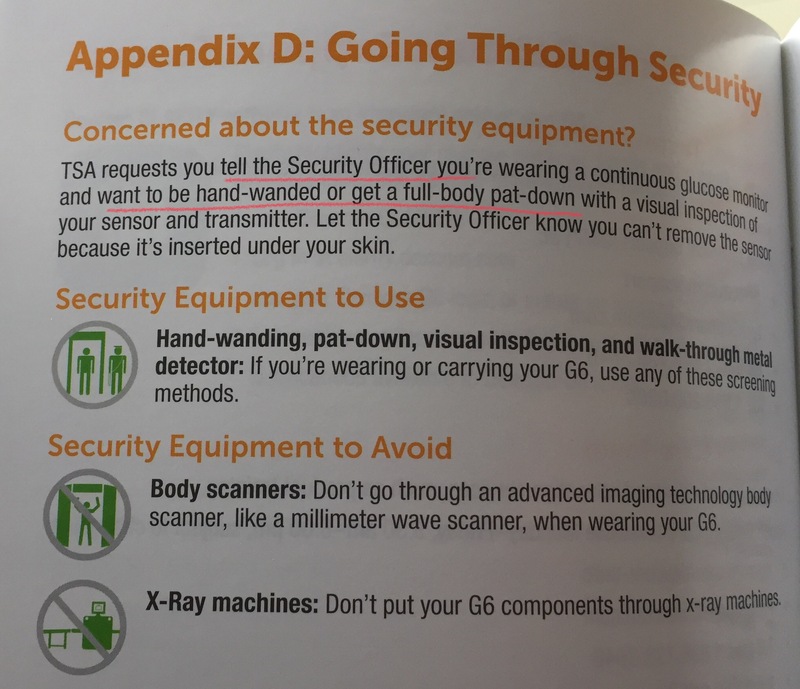 It says “tell the Security Officer you… want to be hand-wanded or get a full-body pat-down….” No one in their right mind would want to get a pat-down! Because of have medical equipment, they ask me to stand aside to wait for a female TSA agent to become available. That has taken from 5 to 50 minutes. I have almost missed my plane a couple of times because of this delay. The agent then gives me a speech about how she is about to touch my groin, my breasts, and all over my body. She asks me if I want to go to a private room, and when I decline, she asks me to spread my legs and raise my arms. She pushes her hands into all the parts of my body, and she places her hands inside the top of my pants to feel around my waistband. In some cases, the agents have been very aggressive and mean. It is a truly demeaning experience that has made me cry several times. Unfortunately, the discriminating and demeaning practices have made me want to minimize flying. How awful for you Libby! I can’t even imagine going through such a demeaning experience. I feel invaded just walking through the evil scanners! We are way more manipulated and controlled than we can imagine!! !